The GMC review of Southampton's Medicine programmes noted the high level of student engagement. 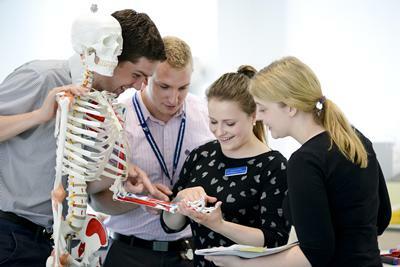 The University of Southampton has received high praise for the delivery of its Medicine training programmes following a five-yearly review by the General Medical Council (GMC). The review highlights several areas of the University’s Medicine programmes that are working well, including the high level of student engagement with the medical school and commends how staff have listened to students and adjusted University processes to improve the student experience. The pastoral support systems that are in place are working well and are highly valued by the students. “We are delighted with the outcome of this review by our regulator, the GMC, and very grateful to our university staff, colleagues in University Hospital Southampton NHS Foundation Trust and our many other placement providers across the region, and our students, who contributed to this positive process,” said Professor Diana Eccles, Dean of Medicine at the University of Southampton and Professor Karen Morrison, Associate Dean Education. “We are committed to delivering the best possible medical education and student experience and we should all feel proud, and spread the word, that the GMC rates our medicine courses so highly. “This review is the result of a lengthy and robust process, involving the submission of over fifty documents to the GMC and a detailed visit by the reviewing team to Southampton, attended by many of our staff and students. “Our students, across all years, were also invited to complete a questionnaire detailing their opinions of the course. They replied in record numbers for a GMC Review, rating the course and their experiences of it very highly. Medicine at the University of Southampton is a thriving and ambitious multidisciplinary faculty – combining excellence in delivering a range of Bachelor of Medicine programmes, for school leavers and graduates and including a unique European programme BM(EU), with an outstanding reputation for expertise in research for patient benefit. In 2017, the Faculty marked the 50th anniversary of the founding of the Medical School at Southampton, and has trained thousands of doctors and clinical academics since, delivering expertise, medical leadership and care across a wide spectrum of health related areas.